When the $5 Posts Quick Start Training Program was first released, I bought it. I've mentioned several times that I use a purely organic marketing strategy to build my online business. I haven't done paid advertising in at least a decade, back when Google Adwords was HOT. First, because Facebook Ads work. They work on ME even, lol. As creepy as I find the whole retargeting concept, the truth is that I appreciate the recommendations and reminders - and they convert me. I recently decided to order a pair of boots online, for example. After Facebook and Google put other related items in front of me... I spent close to $1,000 shopping online all said and done. Nice work. Smart advertising. Why did I choose the Five Dollar Posts training program? Because I love the concept of running the cheapest ads for the biggest results. I also like Ron's teaching style. It's very practical and easy to follow. I invested in two other programs he released this year: Writers Help Wanted and Info Product Mastery. I love the fact that he USES his own methods (successfully), and that he uses them outside the Internet Marketing niche - which really gains my respect. 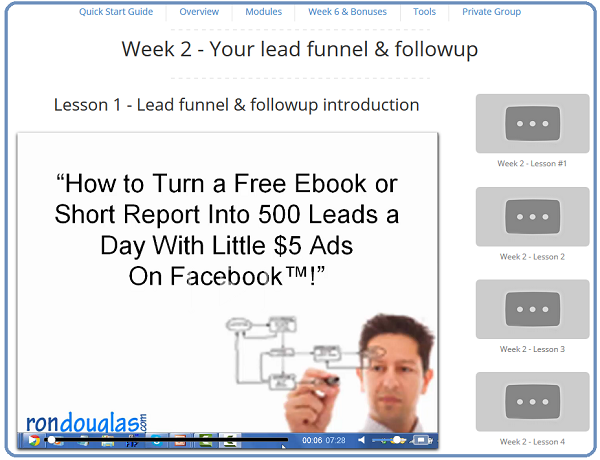 The Five Dollar Posts course is very detailed video training, and includes action steps conveniently listed below each video session. I like that. Unfortunately I do NOT like video based training. I want to like it, I just don't absorb it as well as written guides. I finally wanted the RESULTS bad enough that I decided to dive in and go through it, and just slug through the videos, pausing the video to implement the steps as I went. So that's what I started doing. It wasn't working for me. The training is GREAT. It just takes me forever to listen & watch, understand and retain the concept, then switch back and forth between tabs trying to do it as I go. I think I did actually -lol. Just as I was forcing myself through the first videos, I got a message from Ron that he had ALL of the videos transcribed. YAY! <- I just shouted that in my office (again). haha. This seriously makes my day! They are not available publicly yet, but as an exclusive bonus you'll get ALL the PDF training guides, in addition to the extensive video training, when you order through my link. You'll find the bonus on your download page in JVZoo. Nice, right? 🙂 So yes, you get ALL of the PDF training guides - in addition to everything mentioned on the sales page. I printed them all off this afternoon, and I'm ready to sit down and rock some seriously profitable ads this weekend! Grab the $5 Posts Quick Start Training Program and get started today! "Most people who attempt to use Facebook ads inevitably lose money before they figure out how to properly use the system - myself included. It can be intimidating at first, especially when you’re burning your hard earned cash while hoping for conversions. With this program, I hope to not only show you how to profitably run Facebook ads, but also help you avoid the costly mistakes I’ve made. Facebook is truly a goldmine for highly targeted customer leads, but you have to learn how to properly use the power of their system to filter out the freebie seekers and pinpoint the ideal prospects for your offer. Did you know: The more conversions you run through Facebook’s system, the better Facebook becomes at sending you the most qualified traffic for your offer. Once you’ve “seasoned” your conversion pixel, your ads start to perform a lot better. We teach you exactly how to do that. I got 5dollars product the day you shared. But I did not open it until today. Great, James! Which do you prefer - video training, or PDF guides? Quick question, as I'm a little confused. For those taking Ron's Info Product course, is this Facebook training a good way for someone just starting out to build a new list from scratch or would you consider this more advanced training for down the line? Great question! Ron actually goes through how to start from scratch - so even someone just starting out could use this to build up a list and audience and start making money right away. It's really in depth too though, so even with all my experience in online marketing - and even paid advertising - I am learning TONS! 🙂 I'm implementing as I go, so I'm already ready to run ads today after only a few days of studying & setting up. And that's because I had a busy weekend, so I was only working on it "on the side" lol. To tell the truth, I was a little afraid at first, that Ron was going to be too "market-ey" (haha).... but since I bought the program, I've watched and listened to a few of the webinars and things he's sent out, and I have to say, he really gives a lot of good information. And that's just from the extras he's sent out in email.... I really need to catch up on the actual course content. I'm sure there is a lot to learn from it! I'm learning TONS from the course, including creative ideas for my reviews and landing pages even. I love the depth of information! Check out the PDF version if that's easier for you. You should find it in your bonus section on the download page in your JVZoo account. Enjoy! Finally got around to registering for the course since bought it when you first mentioned it. I didn't see any bonus section on the download page so I guess that means no PDFs for the videos...right? Hi Lynn. This is incredible value!! Your discount is great and the PDF version of the course makes it so easy to learn. Have reviewed the modules and Ron really knows his stuff. Thanks for the notice and I hope that more people get this training!! You must be working the course!! I just noticed your pixel generated AD has shown up on my timeline (right hand side). Good for you and I hope that I can follow your (and Ron's) lead. Facebook pixeling is amazing!! Definitely pdf vith video training. I can refer back the pdf print out instead of flipping the. pdf on my pc. DOING is the key. 🙂 And yes, I love the PDF's. I printed them out, put them in a binder, and am implementing page by page that way. MUCH easier!! Thank you Lynn for the reminder to bind the pdf. I will do it and true it will be much easier to flip also can be kept in one file. This may sound like a silly question but I don't have an active facebook page for my business. I just have my personal facebook account. Can I even do facebook ads without a business page? I'm happy to help with that. 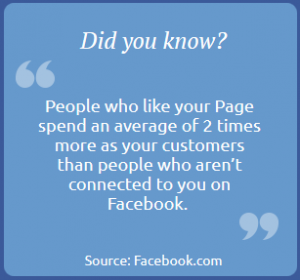 But no, you don't necessarily need a Page. You'll want one though. And your market will thank you for it! You'll eventually run into a problem with a profile as it only lets you have 5,000 "friends" - and I reached that one day and had to start over with Pages. 😛 Not ideal! Looks like I missed out by a few minutes... bummer. I was going to buy... I agree, I need PDF files too. So much faster. Unfortunately the coupon code did expire at Midnight Eastern tonight, but the training is only $37 - and the PDF training guides bonus will still be in your account when you order through my link. That exclusive bonus is set up through my affiliate account. I always learn from the way others do things, but besides the advertising methods... the top two things I've taken away so far are some really neat tips about landing pages - content pages that convert, specifically. And also about Audience Insights. Even if you never run an Ad, you can use Facebook's ad manager to analyze all sorts of insights about your market! Thanks Lynn... ok, if I can still get the PDF guide... it does sound worth it...still more affordable than a lot of the IM releases that are hot right now. Yes, that insight manger does look helpful, once I figure it out. Lynn, Another comment, just had to totally agree with you. Video training is so common these days, but I don't like it. I much prefer written guides, I can glance through, grab the parts that I need and move with it. Mostly, just had to say KUDOs for voicing the fact that some of us just don't do videos well. I rarely attend webinars for the same reason... just not me! I think the advertising is still subtle enough to keep users at ease. I think it's a great opportunity for advertisers to reach and meet people where they are - and the masses are on facebook. I would like to know more about how effective the advertising has been for local businesses particularly, as someone has already told me they had great results with it. Lynn, I am the same way about video. I am a member at Writer's Help Wanted and had an opportunity to get the 5 dollar thing. I did not, and I love written material. You can go back and re-read a lot easier with a PDF, etc. I want it in writing and I think a lot of people are missing out on $$$ because everybody is doing videos now.??? I see that is a PDF now. Just went in and found my purchase for this, way back when. I do not have the PDF nor could I find it on JVZoo, or the video section for this product. I have the Quick Start Guide in PDF. I need to get the PDF and have left a message.